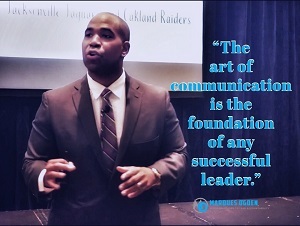 Communication starts with trust, once trust is established you will gain productivity, time management, and higher results. All team members must be striving to achieve the same end results. Our brand has a respectable reputation in the industry for executive coaching our clients with professionalism, respect, and the utmost ethical practices. When people are going to spend their hard earned money with you, they want to be assured to the best of their ability that you are the right person for the job. One of the best ways we tend to build rapport with our clients is through social proof. Social proof, are things like reference letters, testimonials, or video testimonials to show people that not only do you think highly of your services, but your clients do as well. B. Be Accessible via phone, email, text, etc. C. Express your opinion constructively. A. Regularly share all updates. B. Allow all opinions and ideas to be brought to the table. C. Come to a conclusion before ending discussions, so nothing isleft open-ended. A. Seek to understand not to reply. B. Never assume or guess. A. Be 100% at the moment. B. Do not multitask when someone is talking to you. C. Shut off all distractions. D, Take notes if need be. So my challenge to you is..... Are you willing to establish effective communication skills, to help you be a successful leader?